Christophe Leclercq [@LeclercqEU] is the founder of media network EURACTIV and the think-and-do tank Fondation EURACTIV. He is also a member of EU’s ‘High-Level Expert Group on disinformation’. What the media sector needs is not chiefly subsidies, but faster innovation, thinking across boundaries, across borders. And the EU can help innovate. How? By encouraging publishers and journalists to come together, by ensuring a fair regulatory framework for the media, and by supporting where appropriate investment in technology and skills. Surprisingly, unlike for other sectors (from agriculture and steel to cars, chemicals and IT) there has never been an agreed strategy for this important sector. There should be, and it should be about coordination between public and private initiatives, between different EU departments, beyond the short term. I would call this, simply, a ‘European strategy for the media sector’. The media crisis is deep. An overall vision is needed now. With Brexit, the EU will lose the UK hub for international media and also be freed from a major brake on initiatives. With EU elections next May, citizens get a say on priorities for 2019-2024. Two relevant topics dominated policy news in the last few months. On the one hand: fake news, foreign interference and the related populism. On the other: calls to (self-)regulate the internet better and create a level playing field. Both challenges are related: GAFA platforms and journalism are rethinking their co-existence. The vote on the copyright directive, advocated by Commissioner Gabriel, is just one step towards further legislative and business negotiations. At a national level, most countries subsidise the media sector, chiefly via public broadcasting, and sometimes via small support to media companies. At European level, there would not be consensus on a ‘EuroBBC’ or general press subsidies. The media share responsibility for their dire situation. In my experience, most media companies are traditional, relying on past glories, models and technologies. The sector can regain momentum, on at least six fronts: critical mass, skills, business models, languages, investment, users’ trust. On each point, let us see what the EU can do. 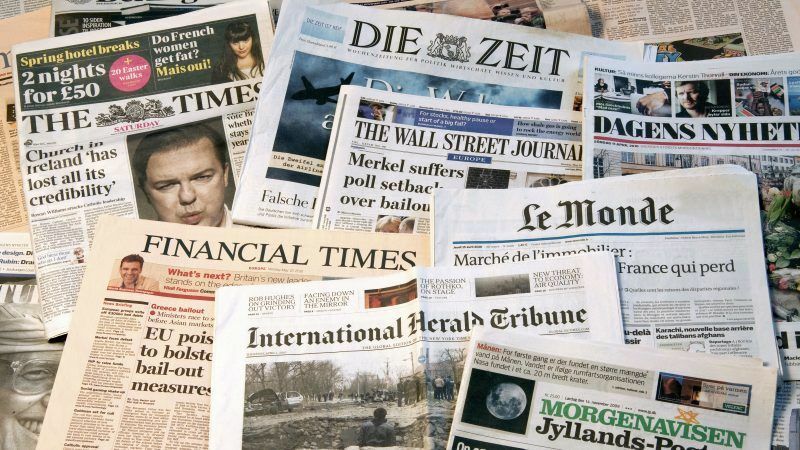 In the past, politicians and journalists feared concentration of too few large media in each country. But what about the “European market”? Now, as a former strategy consultant, I notice that few groups (co)operate seriously across borders; the industry structure is fragmented, not up to the single market and unable to shoulder the high cost of innovation. Hearing different voices is good for democracy, also from abroad, if they are not only in English. Moreover, citizens’ news consumption is now spread between worldwide platforms, broadcasters and revamped newspaper groups. As a former EU competition official, I would say that the ‘relevant market’ is potentially larger, so that company market shares are actually smaller. Hence, the EU could exempt from competition controls certain financial support, media cooperation and media concentration. To look beyond the recent Google cases, to guide policy against market distortions, the EU competition authority could also trigger a sector enquiry, encompassing platforms and media, as it recently did for e-commerce. Media bosses are more often than not senior male journalists and I am not sure they will turn their companies around, as my #Media4EU interviews around Europe showed. There are many training options and awards for ‘rising stars’, far fewer for innovators, and fewer still for cross-border cooperators. Many potential leaders are frustrated, and leave for consultancies, corporations and politics. Against this background, the European Parliament has initiated an exchange and innovation scheme. As it did 30 years ago, when the EU pushed for ERASMUS, this can grow much further. Several new business models exist; let’s focus here on two which are related to policy. First, the EU approach to fighting disinformation can be summarised as ‘Avoid censorship, dilute fake news with quality content’. Notably, Trust Indicators are mandated by the upcoming Code of Practice, to help platforms algorithms promote quality content. The quality media sector could benefit on two fronts: from greater visibility, and – vetted by independent bodies – as providers of such indicators. Secondly, copyright protection could lead to a fairer sharing of advertising and subscription revenues. In addition, the EU could speed up new payment schemes, notably based on blockchain. To harness the ‘Digital Single Market’, as social platforms do, the media need to break language barriers If Europe does not align its ecosystems for translations, language technology and content industries, this will be done in California, with fewer European jobs. There is much relevant innovation beyond language development. Currently, the Google Digital Media Initiative invests more in media’s renewal than the EU itself: is this normal? As ‘pre-competitive’ funding not interfering with editorial matters, R&D funding for media companies is appropriate. The EU started a new wave of projects, notably around data journalism, it should do a lot more. The multi-annual budget perspectives, set soon for 5 years, are an opportunity to prioritize this sector as key for a healthy democracy in Europe. Journalists themselves can also improve on their act. Readers’ trust is currently lower than for friends’ online ‘likes’. The best media enhance their reputation by bridging between core journalism values and the social media landscape. For example, investigative cultures feed fact-checking. Researched reporting leads to data journalism. Public interest fits with ‘constructive journalism’. Funding for such innovative projects can be both philanthropic, or and business-related. The outgoing EU leadership has good intentions, for example, Vice-President Timmermans on press freedom. President Juncker welcomed an ‘ERASMUS for the media’ and talked of ‘armer médiatiquement l’Union’ (providing the EU with media weapons). However, the current Commission delivered mainly on what online platforms had lobbied for: the Digital Single Market. This was necessary, but not sufficient. While current Commissioners and their services prepare legacy proposals, the would-be MEPs and their parties think of electoral platforms.